The current plans are at about 50% design maturity, we have been told, and will develop further as the design team talk with the Midland Metro and Birmingham City Council highways teams to find out about their plans for that area of the city centre. They are hopeful that the details of that will be clear by the time they make their formal planning application to Birmingham City Council in early 2019. Your views and opinions can have an impact on the development of these designs - so please make sure that you take the time to respond. High-quality segregated cycle routes through the HS2 site that link into the surrounding networks are really important. Shared-space cycle routes are not acceptable. There must be a good direct link for cycling under the viaduct into Digbeth. The canal is not a solution. Curzon Circus and Curzon Street need to have high quality segregated cycle tracks that link up with the main corridor routes outside the city centre such as the A47 Parkway route. Cycle parking needs to be convenient, not tucked away at the back of the station. Putting in cycle repair and hire at the entrance to a secure cycle parking facility will make it much safer. You might want to add in the 'Anything else?' box: Adequate cycle parking next to the station entrances; Cycling routes for non-rail passengers to get past the station; Cycle hire facilities. You may want to say that 'Sustainable travel' is one of your top 3 priorities. You might also like to choose 'Air quality in the surrounding area' too, as well as 'CO2 emissions impact'. If you have any accessibility or mobility issues and cycling helps you to access public transport, you can include details here. Push Bikes have several members who find that they can cycle much more easily than they can walk, and so the proximity of cycle parking to their destination is very important. We have other members who require bikes that are not the same common two wheel design, and so cycle parking that accommodates a variety of different cycle designs is important for them. You might suggest that electric bicycle charging facilities would be very useful. Also, integration of cycle hire with rail tickets could be mentioned as well. Currently the plans mainly show shared use cycle routes around the Curzon Street station, although we have been told by email that the designers are looking at a set of designs that include a segregated cycle track. This side of Birmingham city centre does not have as much cycle traffic as the east side, where the NCN 5 and the Worcester and Birmingham canal bring commuters into the city, but this should change if the Birmingham Cycle Revolution achieves its promises to increase cycling rates across the city. With that in mind, it is very important that the designers get the details right for cycle routes in and around the Curzon Street station because the volume of cycle traffic will be increasing substantially, and shared-use routes will not provide the right level of quality for a central station. Where there is a high volume of pedestrian footfall, it can become incredibly frustrating trying to cycle through a shared use area. At least with a segregated cycle track, it is immediately obvious that cycle users are legitimately there when they ask other people to move out of the way. All major Dutch train stations have high-quality cycle tracks flowing around them, and it is important that the HS2 designers follow those examples of best practice. Part of the reason we expect there to be a substantial increase in cycle traffic is that there should be major radial routes coming in from the east of the city, across the Middleway, along Curzon Street and from there into the city centre and into Digbeth. Moor Street Queensway will be closed to private motor traffic, and we have been shown separate plans (as part of the city centre cycle strategy) that have a cycle track pencilled in along there, to connect up the new A34 and A38 routes. With a high quality cycle track along Moor Street Queensway, it will be more important to get a high quality cycle track going along the side of the new station, to provide a clearly defined, fast and comfortable route from the east of Birmingham onto the developing cycle network. The A47 Parkway route was severed by the botched design of Ashted Circus, but there is an opportunity to still deliver a high-quality route if a good quality cycle track is included in the rebuilt Curzon Circus. Residential areas such as Hodgehill, Washwood Heath and Castle Vale will all need to routes that cross the Middleway at Curzon Circus. The canal is too narrow and isolated to take the volume of cycle traffic that we should see, and it is vital that Birmingham's transport planners are not allowed to claim that the Digbeth Branch Canal provides any sort of solution for cycling around HS2. There also needs to be a high-quality link from Digbeth under the HS2 line to Eastside, to the universities and science park. With Park Street being cut off by the new station, the most direct route from Eastside to Digbeth will be New Canal Street, yet the published proposals (below) show the cycle route being taken on a long detour onto Andover Street and then Fazeley Street. We have since been told that there are no plans to ban cycling on the section of New Canal Street that goes under the railway line - and it would be pointless to try to ban cycling as the experience of Corporation Street tram lines shows. But It may end up that there is no cycle specific infrastructure along New Canal Street, because of the tram lines. We will be arguing that there needs to be good quality provision for cycles along this route as the potential volume of cycle traffic could be high here. The construction of the Curzon Street station will cut several existing routes for motor traffic. Park Street will be shut completely between the Clayton Hotel and the junction with Bordesley Street, and New Canal Street will be restricted to trams, pedestrians and probably cycles. Moor Street Queensway will also be shut to private motor traffic, and although the plans suggest that Andover Street will have a through route for private motor traffic, we have been told that shutting that off is being considered to. In effect, there would be no route for private motor vehicles between the Eastside and Digbeth, with all traffic being routed out and onto the Middleway ring road. The main route to drop off and pick up passengers at the station will be from Curzon Circus and down a short stretch of Curzon Street to the back of the station, with motor traffic then having to double back and leave by the same route. These changes will reduce the amount of motor traffic flowing through the city centre, which combined with the 20mph speed limit, will improve cycling conditions in the city centre considerably. It is important, though, that the routes that are carrying a lot of motor traffic do have cycle infrastructure. The plans show several areas for cycle parking across the station. The largest section of cycle parking will be at the east end, next to the car parking and drop-off point under the viaduct. There will also be areas of cycle parking next to New Canal Street and the metro stop, and on Moor Street Queensway. We have been told that the cycle parking under the viaduct will cater for about 1,200 bikes. The amount of parking at the other locations isn't clear to us. All of the locations are expected to have plenty of people walking past them and will be covered by CCTV, but it seems there won't be any secure parking included. For comparison, Rotterdam's Central Railway Station has just under 5,200 parking spaces, while Cambridge opened up a new cycle parking facility with around 2,800 parking spaces in 2016 next to their central station. The amount of cycle parking being provided at the Curzon Street station should be sufficient for a few years, and there will be space under the viaduct to expand it by removing car parking spaces if necessary. But there are two concerns: Firstly, will the parking be secure enough; Secondly, will it be convenient enough. Many major Dutch train stations now have cycle parking that is watched over by CCTV but also has a cycle hire and repair shop at or near to the entrance to the cycle parking. An environment is created that feels too risky for bicycle thieves to try to operate in - there is a greater chance that they will be seen to be leaving regularly with different bicycles and looking shifty going around the parking facility. CCTV on its own, even with a high number of people walking past, does not create the same fear of exposure. Bike thieves will operate in crowded areas and use hoods and hats to avoid CCTV identification. In addition, the cycle parking in most new Dutch train stations is either on the major cycle approach to the station or under the station, with stairs and lifts going up. There is a minimal diversion for people to park their bicycle. But the car park under the viaduct is only convenient for people approaching from the east of the city, and it is not situated directly next to the entrances to the station. The other smaller cycle parking locations will certainly be used, but the main cycle parking might only function as an over-spill when the other locations are full. Cycle parking is far more space efficient than car parking, and cycling should be given a clear advantage of convenience over driving. Placing the main cycle parking at the end of the car parking area is perhaps not the best location. We have been told that the inclusion of a cycle repair shop and a cycle hire scheme are being considered as part of the design process. We recommend that the designers look at the examples of how Dutch train stations are now including cycle parking in the station buildings and learn from those. Making the cycle parking convenient, and including cycle repair and hire next to the main station exit, will make cycling more attractive an option as well as reducing the number of bikes locked up to lampposts and railings around the station entrances. 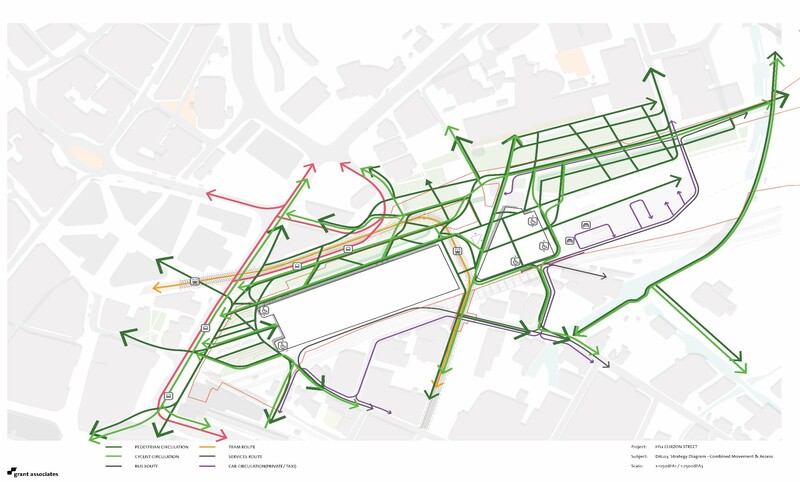 This diagram shows the suggested walking and cycling flows around Curzon Station. Image from the HS2 team. 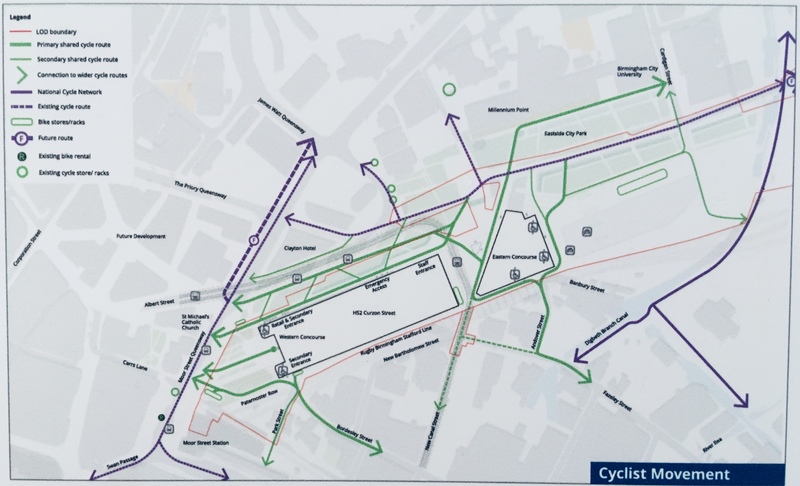 This image shows suggested cycle flows around Curzon Station. The proposals are being adapted, so this plan should only be taken as roughly indicative of what the final routes might be. Image taken at a HS2 Curzon Street design engagement session.